The feast of fools of feedback | Agile KM for me… and you? This entry was posted in Blogging, Oblique topics / off the wall, Shoot post and tagged blogging, feast of fools, feedback, fools, power by Ewen Le Borgne. Bookmark the permalink. Pingback: 가면축제 : 축제(Festival)의미와 사례 다운받기 | Take a chance ! Pingback: 가면축제 : 축제(Festival)의미와 사례 Down | Take a chance ! You’re right, I hadn’t thought of that. Perhaps well facilitated and introduced in ‘safe spaces’ this could approach. When I raised that idea at my previous organisation no one was ready to take the risk anyway. But I don’t despair… Will come the time when it is possible to have such frank feedback among us… Thank you for your comment! It’s an enticing idea… The only problem might be that in the Middle Ages, rank was more or less absolute. It could and would be easily restored after such a feast. In modern times we all believe to be equal, the more lucky ones getting the better jobs. A reversal of rank would prove the modern point we are all equal anyway and there could be a problem of restoring authority afterwards, which for the medieval mind was God-given and completely ‘natural’. @Chahira: Definitely being informed about each other is an essential prerequisite to give feedback. I had in mind small to medium companies, up to 60-70 employees. In those companies there are still silos, isolation and lack of awareness as to what others do, but it’s also easier to bridge those gaps and know at least a bit about what they’re up to. Furthermore, what I pictured was a process when people would give feedback only to the people they feel like giving feedback to, thus avoiding that problem. And yes, the format matters, although pointing fingers is actually part of the concept of the ‘feast of fools’. A bit like ritual dissent, it doesn’t matter if people are giving negative feedback, so long as giving that kind of feedback is framed and guided by the principles of the assignment. Thanks for the update on the carnival in Germany! Sounds like you’re going to have some fun! Yes, it should be part of education. For all of us. But it’s far from the being the norm, therefore other measures – like the ‘on-the-road-education patches’ that our life of working adults provides us – help in getting to that critical thinking and critical sharing. Thanks for the encouragement, it sounds like there’s a really interesting train of ideas there which I also need to further investigate. 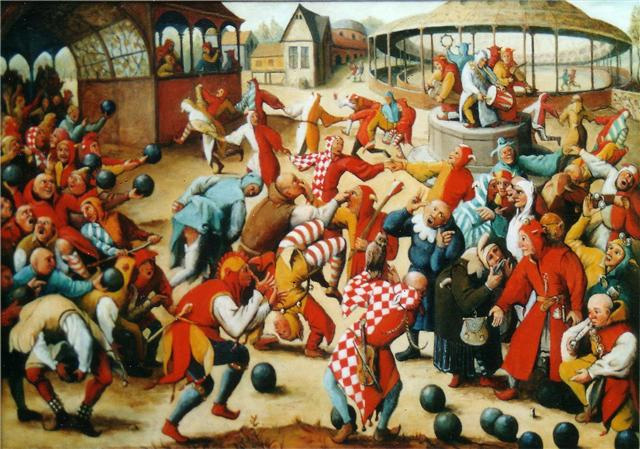 Mikhail Bakhtin’s writing on the Carnivalesque (with particular attention to the work of François Rabelais) suggested the carnival as a wider “cultural code” rather than just limiting it to a particular time and place. There’s a huge relevance to current debates around the free internet (the idea of multiple voices) and parody in intellectual property law (the idea of “forbidden laughter”. As he puts it “Carnival is the place for working out a new mode of interrelationship between individuals”. Rather than a single event, I’d want to see a greater resistance to ideas of hierarchy and “expertism” in education. And students should be actively encouraged to critique (even in the piss-taking, rabelaisian way) the educational structures in which they exist. Great post and a wonderful train of thought. I’d love you to write more on this idea. Yesterday, I had to cancel an online meeting that was meant for getting feedback on a paper. It was a nice mixture of capricious technology, very small audience and time pressure that contributed to this failure. It made me reflect on what are the sine-qua-non elements/conditions to have for an online meeting to succeed and if this option was ideal to get feedback. But I leave this for another blog post. What we know less though, is a bit more about each other in an organization. We very often have no idea or very little knowledge about the projects, initiatives and mandates we as an organization, are involved in. I think this applies to my organization but I am pretty sure it is also common in many other places. We all now about, or have been helping out or organizing one of these “Open Days” where we want to show the World, who we are and what we do. I wonder if we do have, this type of “fair” within the organization and for the organization! The knowledge Fairs are one of the few examples I know of. My point is that we need some background and only then we can give feed back and feed forward a chance. The format remains important as we want to have this as celebration of exchange and avoid pointing fingers, IMHO. @Michelle: Yes, correct. But that’s often too far-fetched for most people when even critical feedback is difficult to expect. Feedback is a very delicate orchid that requires a lot of care to blossom. But feed forward is the future! And I try to practice it from time to time. @Nancy: Sounds fascinating. And you’re right, a virtual environment might be much safer for this kind of experiment. We’re going to have to crack the fear of feedback and failure and feebleness at some point though, there’s no better way to go forward. But back to the previous comment, it’s all part of tending to the orchid little by little. How about feed forward? i.e. Telling people what you would like to see in the future rather than digging up the past…. This seems related to some work friends have done with anonymous participation in Second Life to work on learning about drug and alcohol addiction issues, where our professional identity and “rational” approaches can be blinders as much as anything else (This project, out of GippsTAFE in Australia, was also a great success from what I understand.) The question about cultural and organizational taboos make an online experiment perhaps easier than F2F. Ironic, eh?